VeryPDF PDF Timestamp Adder can be used to add timestamp for PDF through TSA. A timestamp is a sequence of characters or encoded information identifying when a certain event occurred, usually giving date and time of day, sometimes accurate to a small fraction of a second. Timestamp often can be used to record when the document was received. A common example of this type of timestamp is a postmark on a letter. TSA = Time Stamping Authority (TSA) TimeStamp Authority The TimeStamp Authority [TSA] provides an independent time from a third-party, such as an atomic clock, that is then used to provide a timestamp token. The timestamp token is proof that the electronic data, payment transaction or electronic document, or PDF existed at a particular time. The timestamp provides the verifiable evidence and proof required. The TimeStamp Authority Gateway [TSAG] Service Module is intended to provide digital TimeStamping network based services in compliance with the RFC 3161 standard and Internet X.509 Public Key Infrastructure TimeStamp Protocol [TSP]. The TimeStamp Protocol, or TSP, is a cryptographic protocol for certifying TimeStamp tokens using X.509 public key certificates and Public Key Infrastructure [PKI] system. This software is GUI version, which has user friendly interface. So when do installation, please double clcik the exe to install it following installation instruction. When installation finishes,the shortcut iconwill show up on desktop at once. The following snapshot is from the software interface. Please input PDF file by clciking button File then go to Open in the dropdown list. Or you can simply drag file from its container to software interface. Click button Advanced in the top menu list. Then you will enter the following snapshot. Here you need to upload the certificate by clicking button Select. Please click option Create Timestamp Signature then all the blank turn to be fillable. Here please intput the TSA URL. 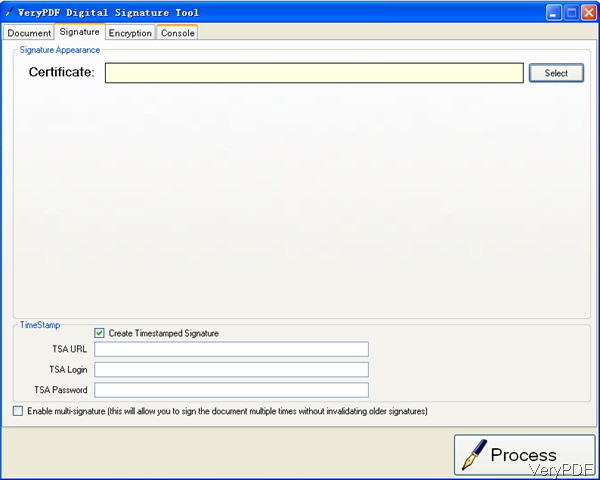 If you need to add multi-signatures, please click the last option. The last step is to click buttom Process, then adding process will begin. When you need to add image stamp like logo, this software also can make for you. Please do as I showed in the following snapshot. Click option Edit Comment then go to the icon of stamp. Then you can add image stamp or logo to PDF document. This is the end of this artcile. During the using, if you have any question, please contact us by the ways supported on contact us website. How do I print background color and images from MS Word document to PDF? How to a digital signature from certificate to a PDF file? This entry was posted in PDF Editor and tagged add stamp. Bookmark the permalink.